PADDY DOWNEY HAS been volunteering at Our Lady’s Hospice, Harold’s Cross in Dublin for 20 years. He is one of 300 volunteers who give up their time to help support the nursing staff in providing patient care. Paddy is known for the flower in his lapel, a staple over the last two decades. Paddy and other volunteers help prepare lunches, organise activities and accompany patients on visits. They also offer companionship to patients, giving them someone to talk to in what can be a difficult time. “You don’t do anything extraordinary. It’s just the same simple things you’d do for your own family if they were sick,” Paddy says. He keeps volunteering because of the laughter and stories he gets to share with the people. In a Sonas session – a regular therapy session where patients and volunteers share stories and songs – he shared a special moment with one of the patients. I sang my party piece, A Group Of Young Soldiers, and there was this lady beside me from a different ward. I didn’t know her but she put her hand on me and she had a tear in her eye, and she said to me ‘I used to sing that song.’ I believe they were the first words she had spoken in three or four months. 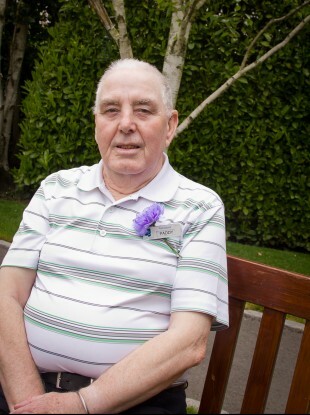 Paddy has built up many friendships during his time at the hospice and says that when people he is close to pass away it can be very difficult, but he has to stay positive as other patients need him. Paddy was diagnosed with cancer a few years ago and is undergoing treatment. Despite this, he still continues to volunteer. The only thing that gets me down is that I feel like I’m not doing enough. I can’t push wheelchairs anymore. That annoys me – not being able to do what I once did. Our Lady’s Care Services Harold’s Cross and Blackrock have been providing care for the local community for almost 150 years. More information on their services can be found here. Read: There is no cure for me. I will die from cancer. Email “'What I've learned from 20 years volunteering at a hospice'”. Feedback on “'What I've learned from 20 years volunteering at a hospice'”.